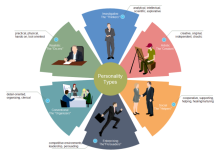 Present personality types in visual circular diagrams. Create various diagrams in an easy to use tool which has automated many operations. Personality has to do with individual differences among people in behavior patterns, cognition and emotion. Simply speaking, personality is what makes the way you are. 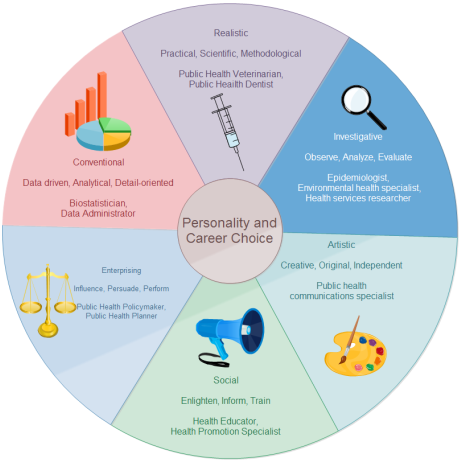 Personality analysis is widely used in various fields of people's life. 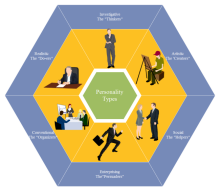 Holland's theory holds that most people can be categorized into six pure personality types. Holland also believe that people of the same personality tend to flock together, creating a work environment that match their personality type, and are most likely to be both satisfied and successful in their occupation and work environment. The Holland theory is widely used by professionals. To illustrate Holland's theory more vividly, Edraw has provided two circular diagrams. Each of these two diagrams requires less than 10 minutes to finish. 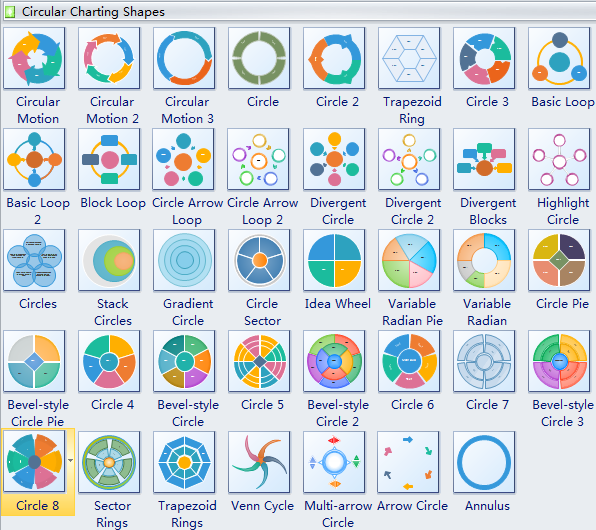 You can also gain circular diagrams like them with Edraw instantly because it includes predefined symbols so that you just need to drag and drop symbols. Download Edraw and try it yourself. See how to create them in the last section. This theory can be applied to help one choose a college major, training program, or a career that fits his Holland personality, which is a vital step toward success - good grades, graduating on time, and job satisfaction. For example, Artistic persons are more likely to be successful and fulfilled if they choose a job that has an Artistic environment, like choosing to be a music teacher in a music school -- an environment "dominated" by Artistic type people where creative abilities and expression are highly valued. The social type is considered as a "Helper". People in this category enjoy assisting people in various ways, like working in groups. And verbal and communication skills come naturally to them. They will be good at organizing activities so activity planner will be a good choice for their career. Refer to the following example. As you can see from the above two examples, Edraw is inclusive and productive. It is capable of communicating ideas through various infographics. In addition to these two templates, there are more smart shapes available for presenting personality types. Only a few simple steps are necessary to summarize the topic by an impressive diagram. Drag and drop a suitable shape onto the blank drawing page. The second example uses Circle 8 as template. Double click each segment of the outer ring to input personality types on by one. The next step is adding people illustrations to visualize each type. Click the Libraries button ; choose Business Scene. Follow the same step to open People and Professions libraries. Drag relevant illustration into each segment of the inner ring. Drag the selection handles to resize the illustrations. If you want to analyze these personalities in more details, use Callout shapes in General group. That is it. So simple and so easy. Of course, the appearance can also be changed with one click through Theme function on Page Layout tab.